Holy Hollywood! This place is as huge as Nicholas Cage's ego, and much, much larger than his talent.. 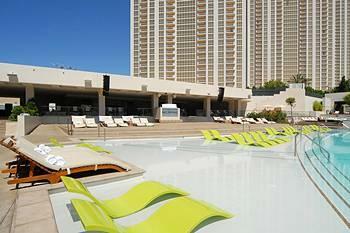 Looking for a poolside Spring getaway? 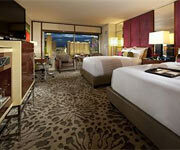 Book a room at the MGM Grand in Las Vegas and receive a $100 resort credit per stay! Click on the green "Use Promo" button the right... Find the Offers tab... Select the desired promotion and book your room! About 36 big 60-inch flat screens with a dozen smaller ones. There are also three monster-screens. That is not to say they will eat you, just that they are rather large, like a monster. About 104 in sports book, set up movie-theater style. In the back it's lounge style, with seats at small tables. About 50 seats are for the race room, each with its own little monitor. The seats are above average in the comfort game and are leather, or something like leather. Oh, and by the way, they have fancy "skyboxes" for their well-to-do clients. Yes, but mostly just if you bet huge amounts. Unless you bet ponies. They get their hooch for cheaper bets. Stage Deli for sandwiches and such. 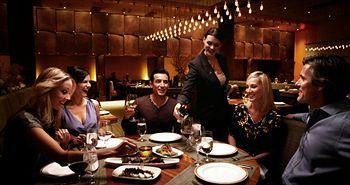 Find some MGM Grand Las Vegas promo codes for meals at the other restaurants here. You didn't just come to Vegas to eat at a deli after all. Twenty-two tables makes it one of the bigger rooms in town. And, unlike most of the other rooms late to the game, this one is pretty dang nice. 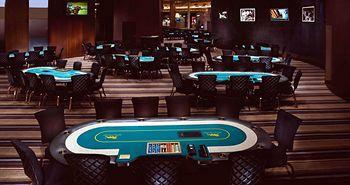 Expect games 24/7 with almost all tables going on weekends. The chairs are very good and the tables are cool. Closed Room or Open to Casino? Not really. 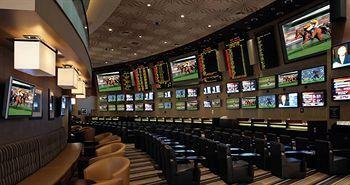 There is the sports book to one side and some hipster nightclub on the other, so you're gonna get noise. Still, this is a nice room with cool tables and a vibe that attracts young, overconfident kids. Texas Hold Em from $3-$6 up to some mid-level games for fixed limit. They also have several no-limit games available starting at $1-$2. They also say they deal stud, Omaha and mixed games, but mostly expect to find Hold'Em. 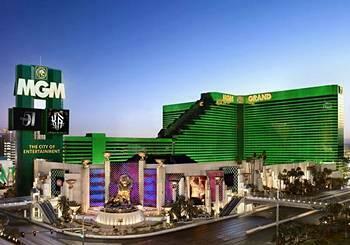 MGM Grand Hotel and Casino Las Vegas offers free poker lesson every day at 10:30am and 6pm. Get there on time for a good seat. How Crowded is the Room? It's a popular room, but it's also big enough that you usually have a short wait. Even on weekends, you likely won't have more than a half hour wait. The standard $1 per hour up to a whopping $10 a day. Whoop de doo. How Good Are the Players? Man, there are so many young kids with backward ball caps it'll make you cringe. 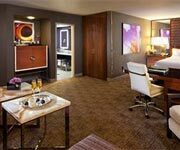 In general, MGM Grand Hotel and Casino Las Vegas is a good room to fleece some kids, so long as you know how to play tight aggressive and go for the jugular with strong hands. Some of these knuckleheads will chase you to the river. Lots of fancy televisions, and a very nice computerized wait list. This is a hipster room, which is sort of good, but sort of lame if all you want to do is play poker without distractions. 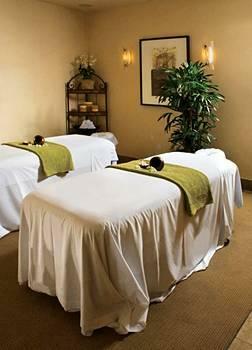 It's a non-smoking room, and they have table side massage and food service. Yeah, the other players at your table will be thrilled when you order a jumbo platter of onion rings. 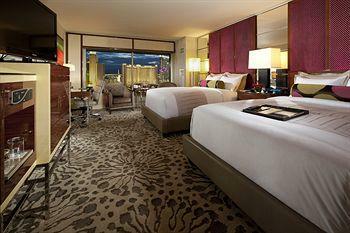 These rooms are in the quiet West Wing with easy access to The Strip. This 350 square foot room has a king bed with a pillow top mattress and two body pillows. A flat-panel TV, DVD player, telephone and Bose Wave clock radio are provided in the separate sitting area. Stay entertained even in the bathroom with the large mirror with 11-inch digital TV screen. You won't be able to bathe in a tub, but there's a shower for two, which is usually just as good. There's a separate toilet room with phone, so you don't have to miss a beat just to...take care of business. Don't bring the children along in this room, because rollaway beds and cribs are not allowed. This 450 square foot guestroom comes with two queen beds, so the whole gang doesn't have to scrunch together for this trip, but after a go at the fully stocked minibar, who knows, you might all end up in one bed anyways. There's plenty of closet space for everyone to bring a full wardrobe, and the in-room safe will house all your valuables. Internet access is included in the resort fee, as well as access to several other amenities on site. This 675 square foot petite suite has one king or two queen beds. An extended living area has a sofa, armchair, coffee table, second TV, desk area, and wet bar with compact refrigerator, so you can practically have a whole other family living in your hotel living room, so make sure to charge them extra rent. The Italian marble bathroom has twin sinks and a separate tub and stall shower, for twice the cleanliness in half the time. Wireless and wired high-speed Internet access is included in the resort fee. 24-hour in-room dining available. 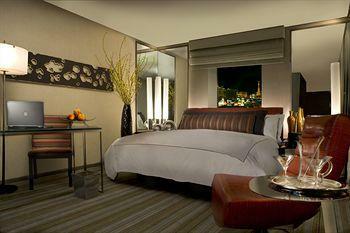 694 square feet make this the largest suite at the MGM Grand. The large sleeping area comes with one king bed and a swivel TV, turn it any way you like, don't think watching TV in bed is your only option. The extended living/dining area has a sofa, two armchairs, an ottoman, coffee table, desk, dining set and wet bar with compact refrigerator. This suite is just like a mini version of your own house, so kick off your shoes and make yourself at home. But you won't be the one doing the cleaning now, so take advantage of your housekeeping services. Then relax in your marble jetted tub, a feature that will make you realize you're definitely on vacation. Huge hotel with really nice rooms and great beds. 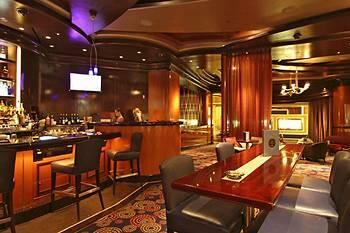 Huge casino with excellent poker room. Line up at checkin was huge and insane huge at check out. This place has everything you can imagine in a LV resort. The MGM Grand Hotel and Casino is grand. 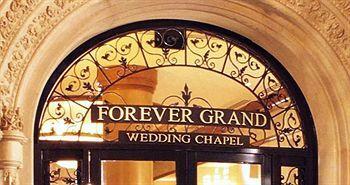 The MGM Grand Hotel and Casino is definitely a grand way to go when you go to Las Vegas. 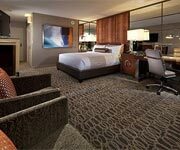 The rooms are very nice and they have many different sizes of suites. 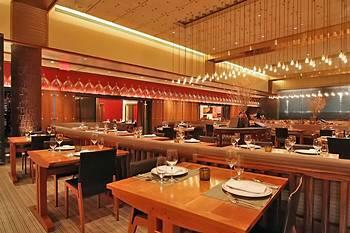 You have many choices of restaurants from the finest restaurant in the USA, Joel Roebuchon to many good casual choices. The hotel is in the center of the strip. The gambling and the shows are good, and the price for the hotel is reasonable. We have stayed there many times and we are always happy to return. 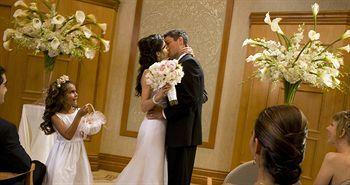 My husband and I stayed three nights at the MGM Grand Hotel and had a super time. 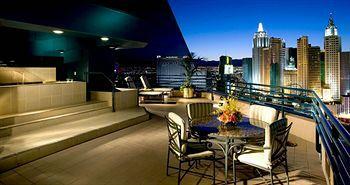 The location is probably not the best on the strip but it isn't bad either. Our room was clean and nice although we have stayed in more modernized rooms elsewhere (not very spacious and they didn't even have a flat-screen tv). The best part about our room was the bed. It was by far, the most comfortable bed we had ever slept in! Oh... be careful with the minibar... The items inside are on sensors so if you move something around, it will come up on your bill so make certain that you go over your bill carefully before checking out.The Grand Buffet was a bit of a disappointment but we were very happy with the 24 hour Studio Cafe. For our last night in Vegas, we decided to do it up and have a nice dinner at Emeril's. Actually it was a bit too pretentious for us though we did enjoy our meals. The pool gets very crowded early and it seemed as if people must have been going down at the crack of dawn in order to save their seats. The pool staff was very friendly and we learned quickly that if you tip good, they don't forget you and will do everything they can to accommodate you. My husband and i love the MGM and every time we go we eat at Robuchon. We recommend the mansions if you can afford it. I stayed at the MGM Grand the third week of January, 2010 and really felt that it was just ok. Don't get me wrong,.. It's nice but the room I stayed in was very outdated and really showed it's age. I don't mind paying $$$ but I do like to get that "WOW" affect. If you haven't ever stayed there before, it is a nice, clean, and well managed hotel. However, given all of the other options for hotels to stay in within the same price range, I think I would try somewhere else on my next visit to Vegas. i came to the mgm because of the many recommendations i had read and heard. i was not let down. we had a great time. i brought my two teenage children. we all had a blast!it's not very central to the hustle and bustle of the strip, but that was fine. we never had to leave the mgm. plenty of gambling, shopping, resturants, and pools right at the hotel.i will definitely be back! !